Guest Claire Carefoot (left) receiving flowers from another quilter- Darlene Kobeluck. The Mulhurst Quilting club ladies have done it again!!!! They hosted another very successful Ladies Day on Thursday October 17th. Two hundred and forty ladies were waiting at the door of the Mulhurst Bay Community League Hall to find a spot to enjoy the program. The 35 members of the club meet weekly in the Hall to share their love of quilting. Some people question cutting perfectly good fabric only to sew it back together, but the quilts end up as pieces of art. These women help the community by making about 70 comfort quilts a year to give to those in need. 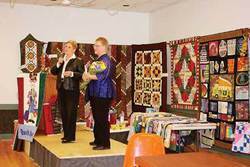 They hung several of their quilts around the hall for the guests to admire. Three quilt items were raffled off: First prize went to Brenda Stock of Ma-Me-O; second to Kathy Walters of Edmonton;and third to Marie Hutsalak of Vasa. The Guest Speaker was Claire Carefoot from Global Edmonton Women of Vision. Ms. Carefoot talked about her tenure on the National Parole Board with various postings until she became the founding Director of Buffalo Sage Wellness House. This is a Native Organization for Aboriginal Women in Canada and houses 16 women, both minimum-security offenders and women on conditional release. Everyone listened with interest; moved by her passion, efforts and successes for Aboriginal issues and corrections. After a delicious lunch Mary Ellen Herman entertained as “Winnie the Wino”, and put everyone in stitches with her hilarious character. The ladies agree that she should forget about quilting and pursue a career in stand-up comedy. Finally, the guests were treated to a beautiful Fashion Show hosted by The Clothing Store from The Village at Pigeon Lake. The owner, Marcy Schmidt, described with detail and humor the fall season outfits worn by her 6 models; 5 of them quilters in the club. A big thank you to these wonderful women quilters who so generously hosted this day to bring such joy to the women in our community!